Israeli navy seizes boat with a few boxes of medical supplies attempting to break blockade of Gaza. A vessel attempting to break Israel's maritime blockade of the Gaza Strip was stopped Sunday, 'Freedom Flotilla' organizers claimed. The seized ship, the 'al-Awda' (Return), was one of two vessels that attempted to break the blockade Sunday. The other ship, 'Freedom,' has not yet approached the blockade. 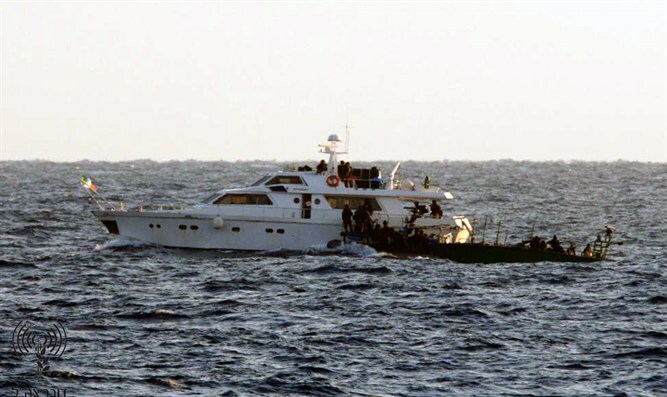 Activists claimed that the 'al-Awda' was carrying medical supplies for the Gaza Strip when the vessel was "hijacked by Israeli forces." The three-vessel "Freedom Flotilla" left Palermo, Sicily, on July 21. One of the vessels later dropped out of the flotilla due to an unspecified "problem." About 40 activists from 15 countries took part in the flotilla. Richard Sudan of Iran's Press TV UK described the flotilla from onboard the 'Freedom,' where he admitted that the vessels did not contain much in the way of true humanitarian aid. "There's a Jordanian MP on the other boat, the Awda, and various activists from across Europe," Sudan said, adding that the blockade challenge "is a gesture of solidarity to the Palestinians." "There is also some medical aid on board, although the amount of medical aid is merely a gesture,” he added. "We're talking just a few boxes." The IDF stated that the navy issued warnings to the ship that it was in violation of the blockade before seizing the vessel and that any humanitarian supplies could be transferred to Gaza through the port of Ashdod. The ship is being towed to Ashdod. Israel has imposed a naval blockade on Gaza for over a decade, meant to prevent weapons from being transferred into the hands of Gaza terrorists. There have been previous attempts to break the naval blockade on Gaza. The most notable was the 2010 Mavi Marmara flotilla, in which nine Turkish Islamists were killed as they ignored Israeli calls to turn the vessel around and dock at the Ashdod Port.